It was, officially, a thing. Friday night I watched three hours. Saturday: two hours, even though I was preaching the next morning. I never stay up late on Saturdays. But the show was that good. So good that after the first two episodes I could go to sleep without the lights! And I just finished the series today at lunch. Eight episodes, six hours total, and near perfection. Here are some thoughts, observations, and questions. 1. As I said, Stranger Things is set in the 80s; specifically 1983. That was an amazing year-- Michael Jackson exploded on the world in a big way, and the last Star Wars ever, so we thought, Return of the Jedi, was released. 2. 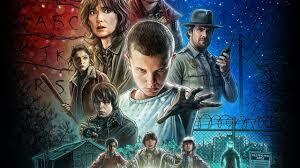 The main characters in Stranger Things are kids who are twelve. I was 12 in 1983. If I had lived in Indiana instead of Texas, they would have been my friends: Dungeons and Dragons, Star Wars... riding bikes all over town. Yup. This series evokes lots of memories. 3. If you liked Stephen King's It or The X Files you'll dig this. 4. The night Barbara went missing, how did Nancy get home? 5. By the way, when was the last time a series featured characters named Barbara and Nancy? Probably 1983. Millennials, let's bring these names back! 6. What happened to Barbara's car? And why wasn't there a community-wide search for her? Where are her parents? Her mom shows up for about 18 seconds. 7. Winona Rider was an icon in the 1990s and then sort of vanished. Twenty years later she is back in a big way. I hope to see more of her in great roles like this one. 8. And Matthew Modine. Creepy. 9. El. Eggos. My kids love them too. Last night I was a guest preacher at Custer Road's youth week opening worship (still feels a little weird to say I was a guest at my former residence from the last three years!). I spoke on unity, and mentioned this series-- the relationships between Will, El, Dustin, Mike, and Lucas are, or become, so intimate over time. I asked the crowd how many have watched Stranger Things, but was shocked to see only a couple of hands. Anyway, if you are into nostalgia, curiosity, determination, monsters, flashlights in the woods, Christmas lights throughout the house, telepathy, a ridiculously checked-out dad, upside down worlds, crying a few episodes after being scared, check it out. What a show.